Glaucoma affects approximately 3 million Americans and over 120,000 will go blind from this disease. 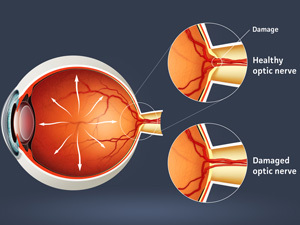 Glaucoma ranks as a leading cause of blindness worldwide. And when it does not cause blindness, it can severely impair vision. Chronic or primary open-angle glaucoma. Other variations include congenital glaucoma, pigmentary glaucoma and secondary glaucoma. There are no warning signs of Chronic glaucoma. About half of Americans with chronic glaucoma don’t even know they have it. Glaucoma gradually reduces your peripheral vision. By the time you notice it, permanent damage has already occurred. If your intraocular pressure remains high, you can develop tunnel vision. You will only be able to see objects straight ahead. Other signs to watch for include headaches, blurred vision, difficulty adapting to darkness or halos around lights.